Some photos and a message from Maggie about the wonderful outing she was able to take the kids on, thanks to Mayan Adventures Tours! 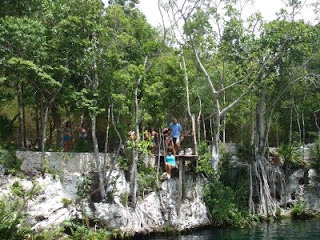 These are photos from the August 5th trip to Cenote Chichin Ha provided by Mayan Adventures. 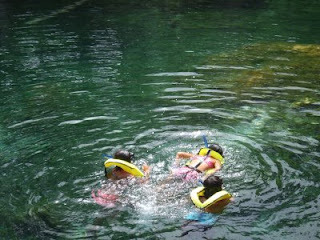 The Cenote trip was a reward for our older students for completing Summer School 2008. The kids were chaperoned by Myrna Pech (Education Coordinator for CEA), Maggie McKown (Hekab Be Library Administrator) and Hekab Be Teachers Reyna Padilla and Gabina Pech, and with the leaders of our tour Miguel and Anna of Mayan Adventures. The tour started with a below ground lecture on the importance of the Cenote System here in the Yucatan and the realization (on the parts of some of the kids and the adults) that there really are underground rivers that traverse the entire Eastern part of the peninsula. 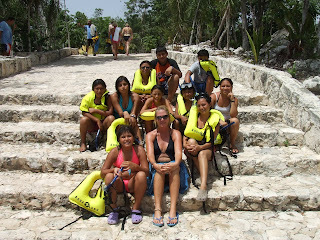 After this the group donned life vests and snorkel gear and went for a guided tour of the main open cenote. They loved the fish (they also have a protected fish/plant nursery in this pool) but it took a bit of time getting used to the cold water. There is also zip-line that zips into this cenote. They loved this – but it was only the females who participated that courageously and excitedly took off from the top bluff and drop into the pool below. Honorable mentions here are: Lisette (who Miguel dubbed the “Mayan Princess”), Ashley (including a backwards zip!) and our own Gabina Pech. Afterwards, we toured by snorkel, the main cavern. Then, we were treated to lunch by Mayan Adventures! We had a great time! The children really love these field trips!